This workshop is a great introduction to western techniques of handmade paper. Participants will be taken through the rich, fascinating and relevant history of paper – from the discovery of the first sample to the way it travels across China, Japan, Korea, Baghdad and it’s journey to Europe. Together we explore the basics of traditional European-style sheet forming with both a traditional laid mold and a woven mold. Students will have a chance to make paper with different sizes and styles of mold and deckles. Participants are shown how to use fibres such as cotton, abaca (Manila hemp) and Ontario hemp to pull their very own sheets of paper. Techniques such as laminating, shaped sheets and inclusions will also be introduced, with opportunity for participants to bring in their own found material to experiment with. 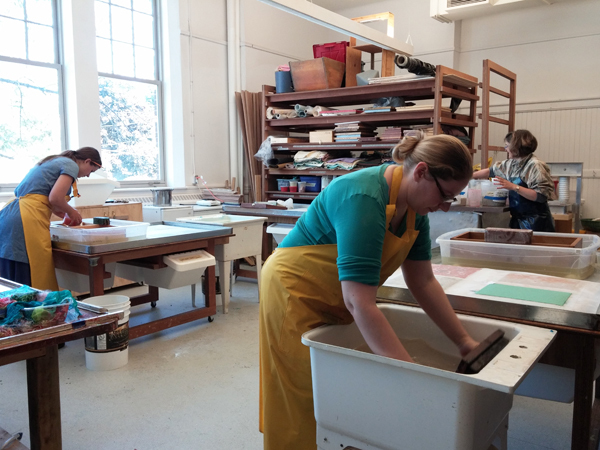 Students will leave this course with 40-60 hand-pulled custom sheets of paper and enough knowledge to continue exploring paper at our intermediate level.